• CNN analyst: "Saudi Arabia will not allow increasing Iranian dominance"
• U.S. general says early pullout would cause "huge vacuum"
(CNN) -- Pulling U.S. forces from Iraq could trigger catastrophe, CNN analysts and other observers warn, affecting not just Iraq but its neighbors in the Middle East, with far-reaching global implications. Sectarian violence could erupt on a scale never seen before in Iraq if coalition troops leave before Iraq's security forces are ready. 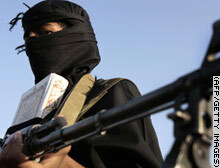 Supporters of al Qaeda could develop an international hub of terror from which to threaten the West. And the likely civil war could draw countries like Turkey, Saudi Arabia and Iran into a broader conflict. President Bush vetoed a war spending bill Tuesday precisely because the Democrat-led Congress required the first U.S. combat troops to be withdrawn by October 1 with a goal of a complete pullout six months later. Bush said such a deadline would be irresponsible and both sides are now working on new proposals -- which may have no pullout dates. "It would also play into their strategy, which is to create a mini-state somewhere in the Middle East where they can reorganize along the lines of what they did in Afghanistan in the late '90s," Bergen told CNN.com. It was in Afghanistan where Osama bin Laden and al Qaeda allied with the Taliban, and were allowed to run terror bases and plan the September 11, 2001 attacks against the United States. Bergen says it is imperative that the United States not let that happen in Iraq. "What we must prevent is central/western Iraq [from] becoming a Sunni militant state that threatens our interests directly as an international terror hub," he said. Don Shepperd, a retired Air Force major-general and military analyst for CNN, agreed that Sunni Muslim fighters who support al Qaeda would seek an enclave inside a lawless Iraq likely riven along sectarian lines into Shiite, Sunni and Kurdish regions. There would be "increasing attempts by terrorists to establish a training sanctuary in Iraq," Shepperd said. "Everyone wants the troops home -- the Iraqis, the U.S., the world -- but no one wants a precipitous withdrawal that produces a civil war, a bloodbath, nor a wider war in an unstable Mideast," Shepperd said, adding that the image of the United States was important too. "And we do not want a U.S that is perceived as having been badly defeated in the global war on terror or as an unreliable future ally or coalition partner." Shepperd, a veteran fighter pilot of the Vietnam War, has served as a CNN analyst of the Iraq war since it began. Bergen was one of the first Western journalists to ever meet with bin Laden, and is considered a leading authority on al Qaeda. Shepperd said Iraq's neighbors would be drawn into the all-out civil war likely if U.S. forces left too quickly. Iran could move in to further strengthen its influence in southern Iraq; Turkey likely would move against the Kurds in the north; and Saudi Arabia would be inclined to take action to protect Sunnis in western Iraq, he said. The oil sector could also get hit hard, with Iran potentially mining the Persian Gulf and attempting to close the Straits of Hormuz, putting a stranglehold on oil flow, Shepperd says. "Oil prices would skyrocket," he said -- perhaps soaring from current prices of about $60 a barrel to more than $100 a barrel, with consequent rises at the gas pump. And that could bring further trouble, Shepperd added. "Saudi Arabia will not allow increasing Iranian dominance to endanger its regime and oil economy." On top of that, Iran could speed up its nuclear ambitions, causing a "daunting and depressing scenario" of a nuclear arms race in the Middle East with Saudi Arabia, Syria, Egypt and Turkey trying to get a nuclear bomb, Shepperd says. Observers such as Jon Alterman, director of the Middle East program at the Center for Strategic and International Studies, say a wider Mideast conflict could be avoided. But Alterman also fears that an Iraq left without U.S. support could turn into a center for international terrorism and a proxy battlefield for regional powers like Iran, Syria and Saudi Arabia. "All the surrounding countries would think their interests are much better maintained not by directly sending troops but by continuing to send money and weapons to the people fighting that war," he said. "In my judgment, it would take decades for such an insurgency to quiet down." There are 120,000 Iraq soldiers now classified as trained by the U.S. military in Iraq, along with 135,000 police force members. But the head of the Iraqi ground forces, Gen. Ali Ghiran-Majeed, recently told CNN that some of his soldiers don't even get paid, and that on any given day one quarter of the force is on vacation. For U.S. troops on the ground, the idea of withdrawal is vexing. "I think it would cause a huge vacuum that the enemies of Iraq -- enemies of the government -- would take advantage of," said U.S. Brig. Gen. Dana Pittard, the commander of the Iraq Assistance Group. Staff Sgt. Matthew St. Pierre is one U.S. soldier who's come to the conclusion the United States cannot win the war, but he says he also fears the consequences of withdrawal. "We are the buffer right now and when we pull out, the people who support us are going to feel the wrath, and the people who are against us ... they're going to ultimately win. And I think that's unfortunate," he said. That is a prognosis that concerns many, though Shepperd sees a viable solution for Iraq, albeit one with a U.S. presence there for years to come. "Done properly we should be in Iraq for years, not in a combat [role], but an embedded advisory role," he said. CNN Correspondent Hugh Riminton in Baghdad and CNN.com Producer Wayne Drash in Atlanta contributed to this story. Analysts fear a U.S. withdrawal could lead to a regional conflict along Sunni-Shiite lines. Here, a Shiite militiaman holds his weapon. Which do you think is the worst case Iraq scenario?